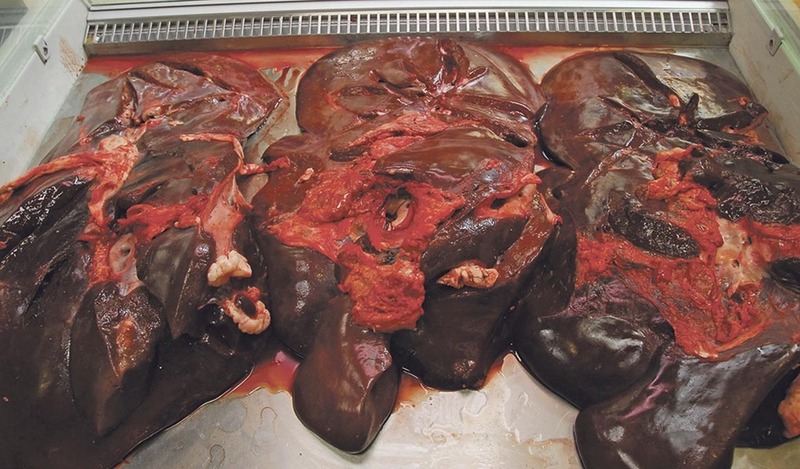 Farmers in south west Scotland should plan for a high risk of liver fluke this year, Scotland’s Rural College (SRUC) vets have warned. Dumfries-based SRUC vet Heather Stevenson explains the combination of a wet September and higher than usual numbers of mud snails infected with the fluke parasite means farmers should take steps to minimise the impact on their stock. Ms Stevenson says: “Increased areas of wet ground can lead to an increase in mud snail numbers. In addition, our recent snail counts in the local area showed 20 per cent of them to be infected with the fluke parasite, compared to four per cent at the same time last year”. Mud snails, living in boggy or wet areas, play an essential part in the life cycle of the liver fluke parasite. The eggs produced by adult flukes pass out in the animal’s dung, hatch into larvae and live inside the snails for a while before emerging to stick onto blades of grass where they form cysts, ready to be eaten by livestock. “Our current advice would therefore be to plan for a high risk year”, continued Ms Stevenson. “We would advise farmers to move stock, particularly sheep, off high risk fields as soon as possible”. For more detailed information on liver fluke, SRUC offers an online technical note providing up to date information for both vets and farmers: www.sruc.ac.uk/downloads/file/3135/tn677_treatment_and_control_of_liver_fluke.